Recruiting and retaining top talent is one of the biggest challenges faced by small and medium sized businesses across Northern Ontario. Unavailability of skilled workers is a major threat to our local area businesses, as recruiting and retaining employees is essential in growing and maintaining a company. The challenges of recruitment and retention can be curbed by small and medium businesses setting themselves apart from the competition, and offering unique benefits that help them stand out from the crowd. The first step in attracting and retaining talent is making the area they live and work in seem as big and vibrant as their lofty career aspirations. Big city life has always been promoted as the more “glamorous” option for professionals, but that doesn’t have to be the case. There are a wide variety of advantages to living in smaller cities and towns like those found across Northern Ontario: tight knit communities, lower cost of living, shorter commutes, less traffic, and the promise of year-round recreational activities like camping, fishing, skiing and hiking. The financial benefits of living in Northern Ontario can’t be overstated enough either. Sports for kids, family activities, and services such as personal trainers are available here for much less than comparable services in Ottawa and the GTA. Northern Ontario businesses should discuss the many benefits of our area. Tell recruits about the activities you and others love to do, show them your favourite hangouts, and point out all of the benefits of our wonderful community. The health and wellness of employees is often overlooked by employers, but it makes a tremendous difference to candidates and existing employees. Having an employer who actively looks after their staff is an attractive prospect, and can be the deciding factor in choosing a place of employment. In many cases, an attractive workplace compensation package is valued higher than a raise or bonus, especially when it comes to health and dental insurance. The Chambers Plan supports thousands of small and medium-sized enterprises around the country with wellness and benefits plan support, helping your business better accommodate the health needs and concerns of staff members and candidates. The Chambers Plan can be tailor made for businesses of any shape or size, with plans based on the needs of your company and its employees. The “Best Doctors” program, for example, ensures that your employees will be able to gain easier access to specialists and other medical professionals. 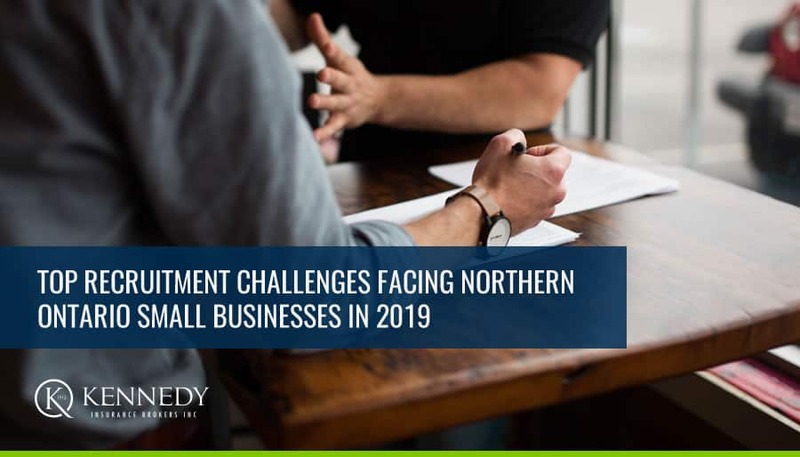 Another major barrier that is preventing Northern Ontario small businesses to recruit and retain top talent is a perceived lack of growth and opportunities for advancement. While this perception is false, many SMEs don’t do enough to highlight the many opportunities for growth that are available within their business. Smaller companies provide opportunities to work in areas and learn skills that wouldn’t be available to them in larger environments. These acquired skills can very easily lead to new roles and career opportunities within your business. Providing candidates with a road map of how they will progress in your organization can go a long way towards snagging top talent. Whether the job in question is set in a sprawling metropolis or in the middle of nowhere, In almost every case, the most attractive looking job offer is always going to win. This means having the ability to offer candidates and current employees unique perks that other businesses aren’t putting on the bargaining table. This can be as easy as being flexible in areas like allowing remote work and hosting regular team outings, or more valuable perks like access to wellness services, prescription drug coverage, or retirement savings plans. With the Chambers Plan, your business will be able to offer these unique benefits to future candidates and current staff members, giving them a reason to choose your company over another. Offering unique benefits including group retirement options, paramedical services like physiotherapy and massage therapy, and prescription drug coverage will be a major competitive advantage for your organization. The Chambers Plan representatives at Kennedy Insurance will help your business create health, dental, retirement, and other benefits programs that will suit the unique needs of your employees. Offering group benefit insurance and emphasizing the many benefits of working in a smaller environment will lead to your organization looking more attractive than similar offers from other businesses, or businesses in larger centres such as the GTA or Ottawa. Unique perks and benefits from the Chambers Plan create a happier and healthier workforce, leading to growth and prosperity for your business. Contact Kennedy Insurance today to find out how we can help your Northern Ontario business easily and affordably recruit and retain top talent. © 2019 Kennedy Insurance Brokers Inc. All rights reserved.